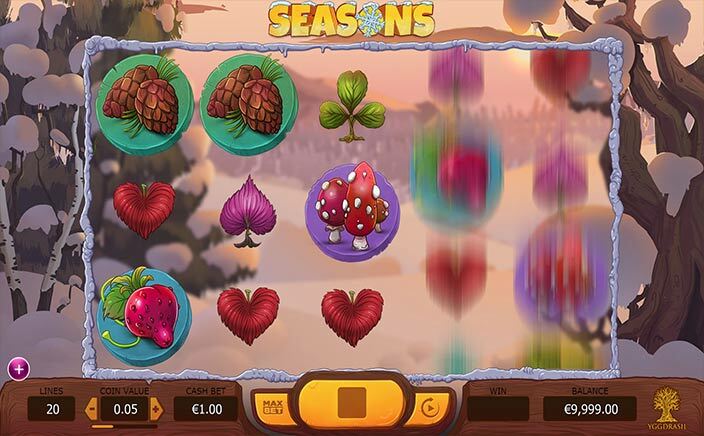 With Seasons – Yggdrasil brings in a video slots game which represents the four seasons and nature theme built beautifully on a slot game. Get ready to play an interesting feature named Wild quartet that brings in a multiplier with it every time it appears on the screen. Yggdrasil has a very interestingly incorporated video theme into a slot game with four distinct weather formats i.e. spring, summer, autumn, and winter. Experience Seasons Like Never Before! As the name goes, the slot is themed on four seasons with each having their own characteristics on display. With a beautiful music playing on the background, you are going to see animals like Deer, Fox, owl, Hare etc. The greenery, flowers and a pleasant layout of the screen are for the players to enjoy. There are also symbols like berries, leaves, toadstool and pine cones on display on the reels. All of these cute display and theme come together to build a unique experience. This slots by Yggdrasil Gaming is a progressive game with four season themes. The game keeps up to 30 free spins for the players to win. The Wild icon keeps changing for each season and on an average about 10-15 slots later the season changes too. The maximum payout is £50,000 with low to medium variance slots. The minimum bet to be out per spin is £0.2 and the maximum is £100 per spin. One can begin with a minimum of £0.5 and level it up to £1 when required. How To Score Bonus In The Game? In every season, the Wild changes and thus changes the bonus with it. While in autumn the Wild being Fox multiplies the score 10 times when it appears on the reels, during the winters the Wild is Hare which duplicates i.e. creates additional wilds and gives the bonus. The best season is the summer when the Deer (wild) expands in a cross pattern to give the biggest bonus. Spring Wild is Owl and it gives free spins and additional owl when the Wild appears on the screen. There are free spins icons on the reels – as they appear you are given free spins. For 3 spin icons, one gets 7 free spins. Seasons by Yggdrasil is a delight to the eyes. With animals all around and a colourful screen – it brings total excitement. There are ample bonus and free spins to win a lot in this game. 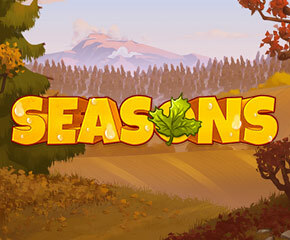 No matter what the season is ‘Seasons’ is good to play every time.